It has been almost a decade since NASA launched the unmanned New Horizons space probe as the beginning of their New Frontiers project (a series of space exploration missions conducted by NASA). 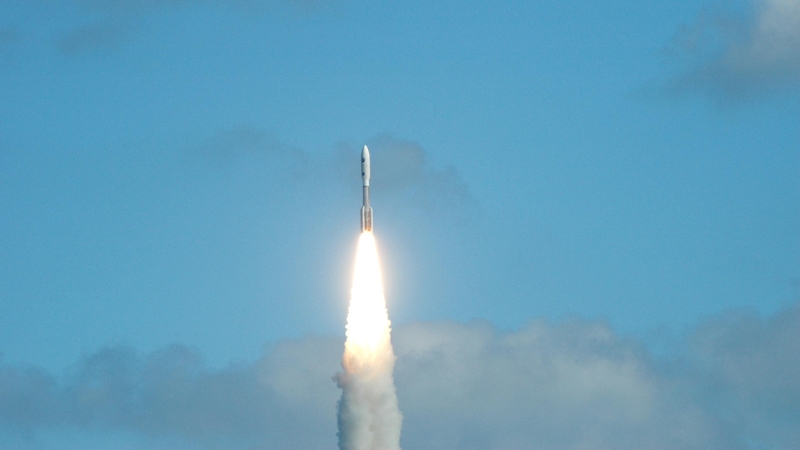 Launched in January 2006, the purpose of the New Horizons mission was to travel to and study the dwarf planet of Pluto, its moons and the Kuiper Belt. As you most certainly have heard by now, the space probe very recently completed its 3-billion km journey to one of the Sun’s most distant rocks, and for the last week has been transmitting various images and data of its celestial company back to Earth. Now you’ve probably seen your share of the information New Horizons has been sending back to our home planet, but how much do you know about the spacecraft itself? The device that made planet Earth fall in love with space all over again? In this piece we’d like move the attention away from New Horizons’ immediate achievements and focus on the innovations and highly developed technologies that made this one-of-a-kind journey possible. 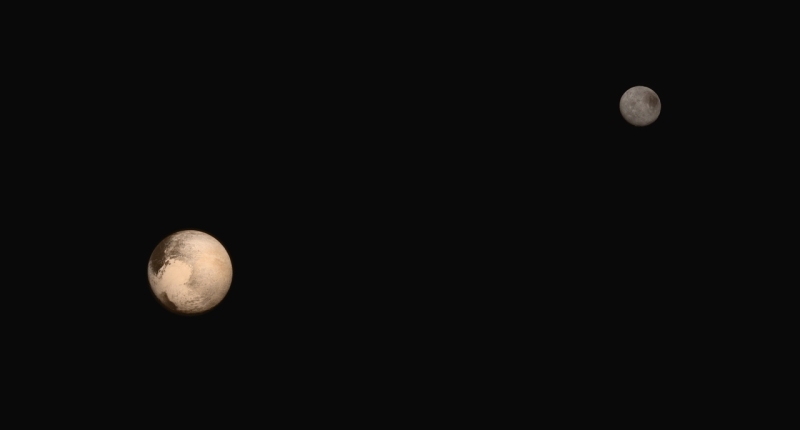 The main purpose of the New Horizons mission it to answer three simple questions: What does Pluto look like? What is it made of? And lastly, what kind of atmosphere does it hold? As simple as these questions may be, answering them might hold the key to a much greater and complex understanding of our solar system and even the universe as a whole. 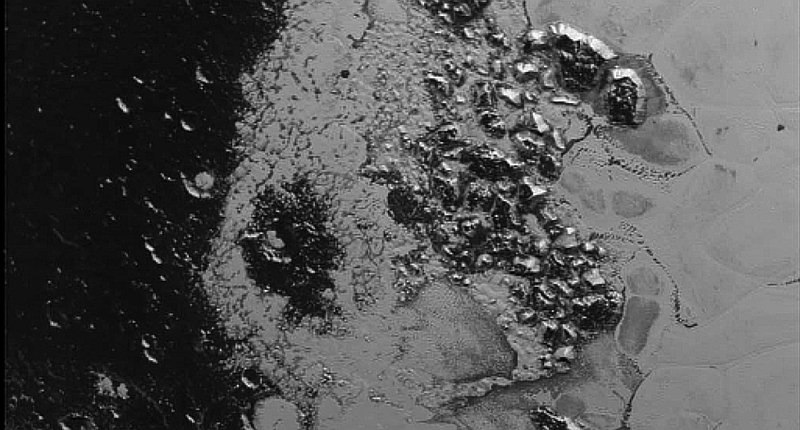 With Pluto, if you want to understand the atmosphere, you have to understand the surface. If you want to understand the surface composition, you have to understand the geology. If you want to understand the geology, you’ve got to understand the atmosphere. It’s all tied together and so we have instruments to study every aspect of Pluto. For a spacecraft that carries such a big responsibility, New Horizons is actually rather small – about the size of a baby grand piano to be exact. Another interesting fact is that the 12MHz MIPS R3000 CPU found on New Horizons is the same chip found in the original Sony PlayStation. It has only been repurposed to “fire thrusters, monitor sensors and transmit data”. Installed on this modest space probe, are seven highly sophisticated devices that all play an integral role in gathering the extensive data and impressive images we’ve seen this past month, and then beaming them back to Earth. NASA lists these devices with the obvious list of acronyms and affectionate names: Ralph, Alice, REX, LORRI, SWAP, PEPSSI, and SDC. All of these technologies have been ingeniously designed to work together seamlessly. Remarkably, not one of them uses more power than the average home’s nightlight. Ralph is the space probe’s main colour wide-angle camera and the device that will snap the main global maps of Pluto. It is one of three cameras on board New Horizons and captures both visible light and a certain range of infrared light. It sports a 75mm lens that captures images at an fixed aperture of f/8.7. Because of the freezing temperatures in the farthest reaches of space, Ralph has to be built out of materials that would be able to handle the drastic shrinking caused by the intense cold. Because different materials shrink at different rates, it was also crucial to use as little a variety of materials as possible in the construction of the device. “We actually built the mirrors and the chassis out of aluminium so that as they shrink, they would shrink together, to maintain the same focal length. We could do a reasonable test on Earth and still expect the same quality image,” explains Lisa Hardaway, the engineer who lead the development of Ralph. As aluminium is a dull, mostly non-reflective surface, it had to be sharpened using hardened diamonds as to act as the camera’s mirrors. The lens is the only part of the camera that was actually made out of glass which is quite a departure from traditional cameras. Alice is the second of New Horizons’ three cameras. It’s a described as a “general-purpose UV imaging telescope/spectrometer”. The spectrometer is a device that separates light into constituent wavelengths, much like a prism. New Horizons though has a “imaging spectrometer”, meaning it not only separates the wavelengths, but produces an image of the target at each wavelength. 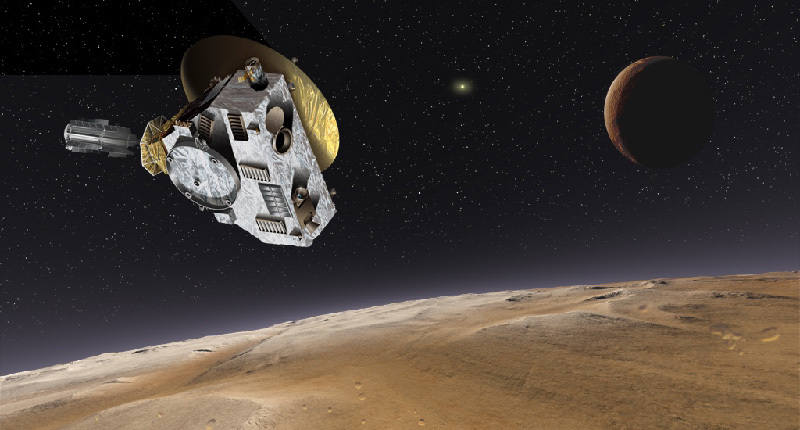 On New Horizons, Alice is used to study the atmospheric composition of Pluto. New Horizons before its journey across the Solar System. Alice has two modes of operation, “airglow mode” and “occultation mode”. Airglow mode measures the emissions of atmospheric constituents, while Occultation mode where the sun or a bright star is viewed through the atmosphere producing absorption by the atmospheric constituents. REX is a passive radiometer that is designed to measure atmospheric composition, temperature and pressure, and is the instrument used to determine the overall conditions on Pluto’s surface. REX will also measure Pluto’s (and one its moon, Charon’s) night side emissions. It will also augment New Horizons’ radio transceiver used for spacecraft communications and tracking. REX is basically a very small printed circuit board that contains highly sophisticated signal-processing electronics that are integrated into the New Horizons’ telecommunications system. 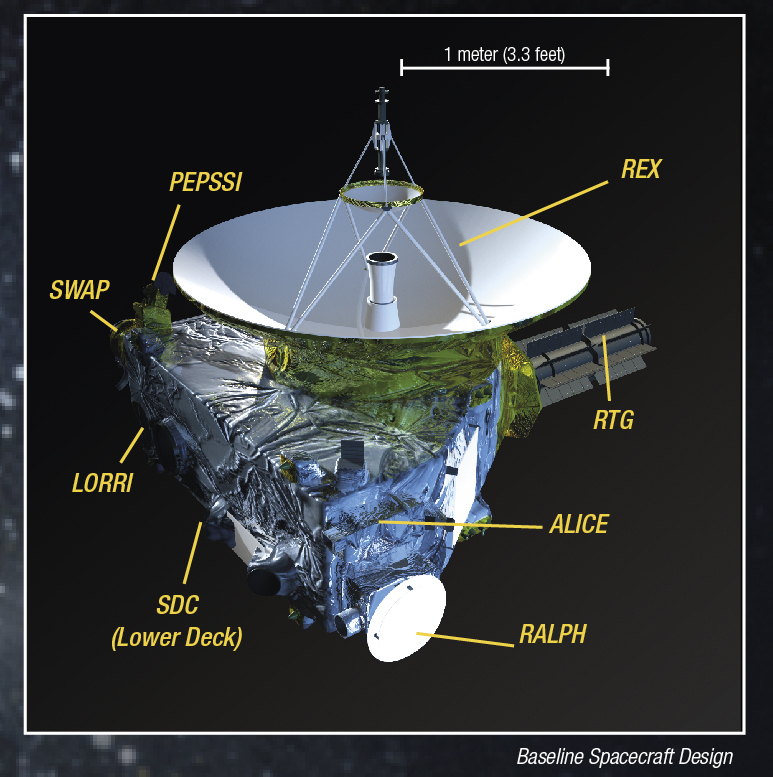 As there are no human passengers on the New Horizons probe and no need for a telecoms system, the ship carries two copies of REX that can be used simultaneously to improve the data returned from the radio science experiment. REX will be using a occultation technique to probes Pluto’s atmosphere and to see if Charon has any signs of an atmosphere. 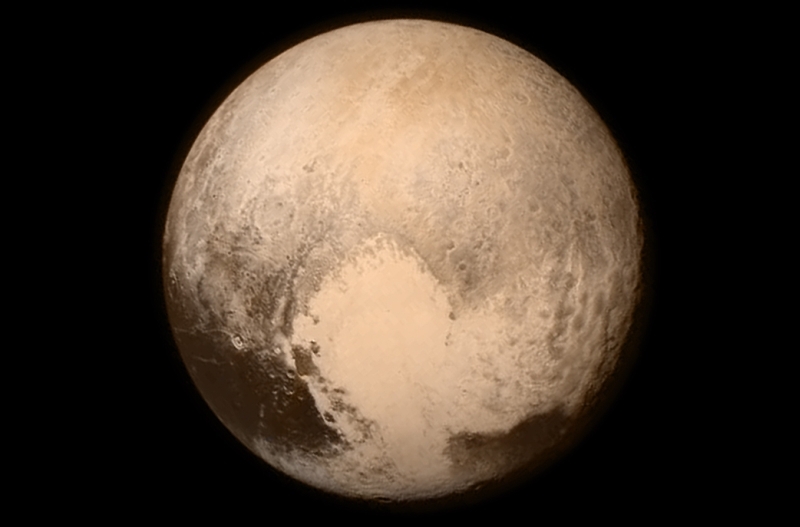 After the New Horizons ship passes by Pluto, it will point its allocated dish back to Earth. On previous space missions using this technique, the signal would usually be sent from the ship, through the target atmosphere, to Earth (called a “downlink” radio experiment). The New Horizons mission is the first to switch this method around and transmit the signal from Earth. This is because this missions is taking place so far from our home planet that only a large, ground-based antenna is can send a strong enough signal to travel the immense distance. 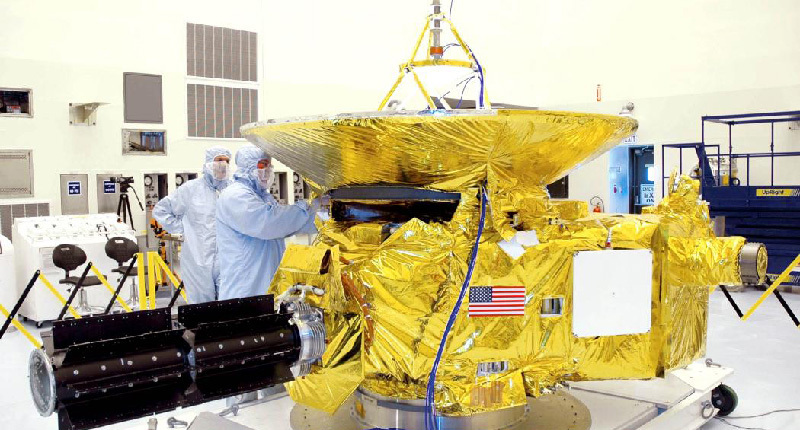 LORRI is the third and final camera installed on the New Horizons space probe and the one that sent back the first images of Pluto a few days ago. It’s a large black and white telephoto lens that is mainly used for navigation and studying the surface of Pluto. According to NASA, it is a “telescopic camera” that “obtains encounter data at long distances, maps Pluto’s far side and provides high resolution geologic data”. Essentially it’s a digital camera with a massive lens that has been fortified to endure the harsh condition of space, much like Ralph. Although, where Ralph was built with aluminium parts, LORRI is constructed of a unique and innovative silicon carbide material to keep the camera focussed as it passes through the intensely fluctuating temperatures on its journey. LORRI has no colour filters or moving parts, and the operators will have to rotate the entire New Horizons craft to capture the images they want which makes it a litter trickier to operate. As its name suggests, SWAP will measure Pluto’s interactions with the solar wind (the stream of fast charged particles that flows from the Sun). As the Sun and Pluto are separated by a monolithic distance (somewhere between 4- and 5-billion kilometres), SWAP also boasts the largest aperture ever used to measure the solar winds. SWAP measures the low energy interactions such as those caused by the solar wind. By measuring how the solar wind is disturbed by the interaction with Pluto’s escaping atmosphere, SWAP will determine the escape rate of atmospheric material from Pluto. These measurements are important as by measuring the amount of Pluto’s atmosphere that is escaping into space provides significant insights into the structure and density of the planet’s atmosphere. PEPPSI is the most compact, low-power directional energetic particle spectrometer ever flown on a space mission. Its purpose is to search for neural atoms that escape from Pluto’s atmosphere and become charged by the solar wind. It also detects other materials that escape from Pluto’s atmosphere (molecular nitrogen, carbon monoxide, methane) that break up into ions and electrons after absorbing the sun’s ultraviolet light. By using PEPPSi to measure these escaping particles, scientists will be able to determine the rate at which the atmosphere is escaping from Pluto and gain a new understanding the molecular construction of its atmosphere. These particles enter PEPPSI and collide with electrons placed on a thin foil and then bounce to another foil before hitting its solid state detector. It clocks the time between these collisions and by it can determine the speed of the particle (basically measuring its mass). Once it hits the solid state detector, the particle’s total energy will be measured. By using this method, scientists can verify the composition of each particle. Lastly, the SDC will be used to measure the concentration of dust particles in the outer solar system. It is the first scientific instrument to be flown on a NASA planetary mission that has been fully designed and built by students (in this case by a group of students from the University of Colorado). 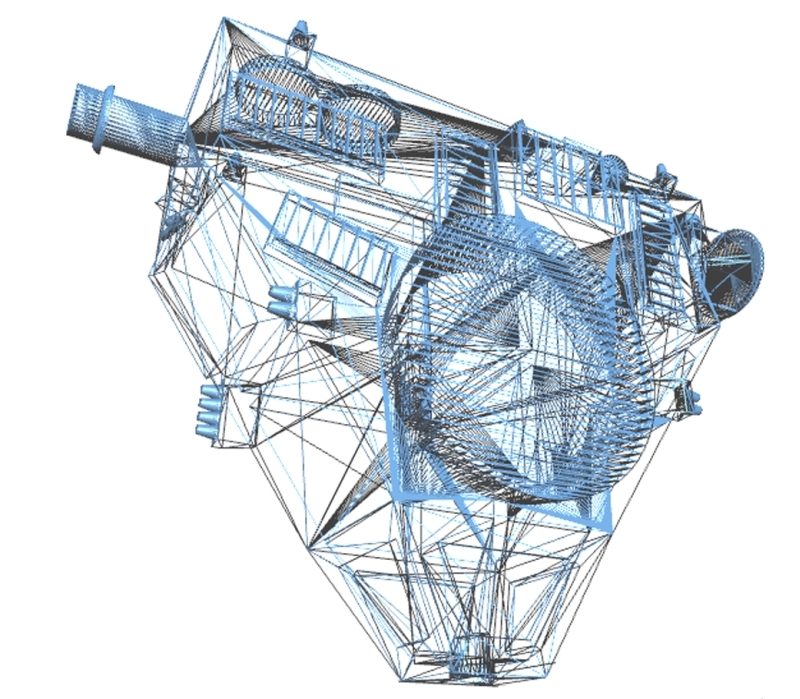 The SDC counts and measures the sizes of dust particles and produces information on the collision rates of similar bodies in the outer solar system. 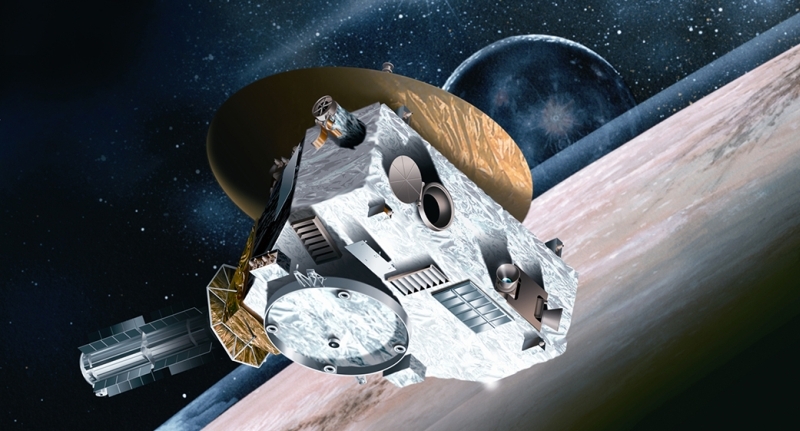 The device consists of two main components: a detector assembly mounted on the outside of New Horizons so that it can be exposed to the dust particles, and a electronics box inside the space probe that will be deciphering the data. SDC is also the first dust detector to be flown more than 18 astronomical units (about 2.7-billion km) from the Sun and it will give scientists an unprecedented look at the sources of transport of dust in the solar system. New Horizons is an amazing piece of kit especially considering what it has already been through and what it has yet to encounter. Although we have a better understanding of the outermost world in our Solar System, there’s even more to discover beyond, and New Horizons will be at the forefront.